Ryan Brady has been living in the Beerhorst house for a good while. He is an amazing artist and just a great person to have around. As far as we are concerned at this point he is just family. This week we have had July temperatures in March. Instead of freaking out about climate change we have been working together the past few days painting the carriage house studio. Ryan will be leaving us next month to go work on an organic farm for the summer. He will be sorely missed. Check out his art here. We have had all kinds of really great young people live with us over the past six years. We enjoy living in community and learn so much in the process. 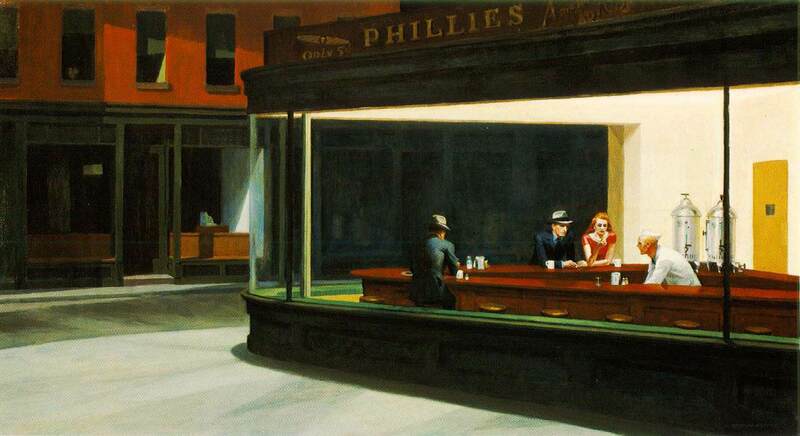 I feel like we were all born into a culture that often comes to us like Edward Hopper's painting Nighthawks. A place where people may be next to each other but there are no real connections to bind them together. In our house and in our neighborhood, are wanting to go beyond that and create a place where people can really connect in meaningful ways. We want a community where we can all grow into the people we have the potential to be.